On Valentine’s Day, I asked Mr. Handsome what he wanted for dessert, and he replied, “I’m always up for crème brûlée, but I’ve heard it’s hard to make.” I loved the idea but had also heard the same thing. Hoping to prove them wrong, I Googled “easy crème brûlée recipes” and found a few that used instant pudding mix…yuck. 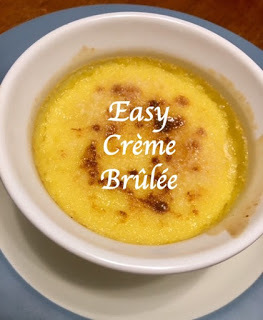 After spending a little more time on the internet, I discovered that the ingredients in crème brûlée are very simple, and although the process requires the chef’s full attention, it doesn’t actually take that much time. I didn’t have a kitchen torch, but I learned that I could use my oven’s broiler setting. Now I usually don’t copy other bloggers’ recipes, but I found the perfect, easy crème brûlée recipe. I have made it twice and have received rave reviews from Mr. Handsome and several guests, so rather than reinvent the wheel, I’ll just share the link. There’s a video, but I honestly didn’t watch it. The written recipe has plenty of detail. I will say that in step seven, when you’re using your broiler setting to create a caramelized crust, turn the oven light on, and position the baking dish in the middle of the oven so you can keep an eye on your dessert through the window. Don’t just setting the timer for 3 minutes and walking away. Sit there and watch it the entire time. The first time I made it, my crème brûlée burned after only 2 minutes (it was sitting on the second-from-the-top rack, which I don’t recommend). If that happens to you, just grab a fork and lightly lift the top layer off each crème brûlée, and voila…good as new! Then you can repeat the sugaring step and try again. Mine only took 1-2 minutes. Also, I don’t recommend looking at the nutrition facts below the recipe. Crème brûlée is by no means healthy, but a little treat now and then never hurt anybody.